“What a long strange trip it’s been.” It was the Grateful Dead who sang that line, but it’s David Parsons who has actually lived it. 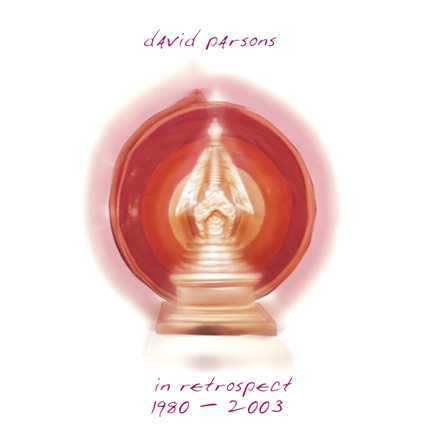 In Retrospect: 1980-2003 is a double CD retrospective of David Parsons’ recording career, one heavily influenced by other cultures and extensive travel. In 1965, before the Beatles/sitar explosion, Parsons was at a barely attended concert by legendary Indian sitarist Ravi Shankar. “It was,” he says, “love at first sight.” He bought himself a sitar and began to teach himself. It was in India in 1975, while studying proper sitar technique with Krishna Chakravarty, that Parsons heard the other sound that would change his life—the synthesizer. He mixed electronic and natural sounds together with those of his sitar and in 1980 put some of these homemade tape pieces on a cassette called Sounds of the Mothership (17013). It was heard by Ethan Edgecombe of the fledgling New Age music label Fortuna Records. Now on an American label, Parsons moved up to the next generation of synthesizers. Inspired by this new technology, Parsons created Tibetan Plateau (17013). “I still couldn’t believe people wanted this,” he says—but in fact they did want it. Even during the rise of New Age music in the 1980s, David Parsons stood apart. There was he acknowledges a darker side to his music, a suggestion of hidden depths that echoed the sounds of the deep night ragas of india, that can be heard on Yatra (18072), Himalaya (17059) and Dorje Ling (17076). In 1989, while visiting exiled Tibetan monks at the Dip Tse Chok Ling Monastery in northern India, Parsons recorded some complete ceremonies. Fortuna Records distribution was now performed by Celestial Harmonies, whose owner, Eckart Rahn, had already shown an interest in traditional Asian music. Music from Sacred Ceremonies - Ritual Music of Tibetan Buddhism (17074) was used by directors Oliver Stone in his film Heaven & Earth and Bernardo Bertolucci in Little Buddha. It was an auspicious beginning for what would become a second career for David Parsons. Over the next few years Parsons traveled the world for Celestial Harmonies, producing The Music of Cambodia (19902), The Music of Vietnam (19903), The Music of Islam (19907) and The Music of Armenia (19909). Parsons finally returned to his own music in 1997. Drawing on the melodies and instruments he had recorded around the Eastern Hemisphere, he set to work on a project that would bring the amazing experience of the world’s ancient acoustic tradition into an electric setting. It became Ngaio Gamelan (13171). His next two albums brought him full circle. Shaman (13181) was an electronic imaging of a gathering of mystics, done at a time when Parsons was again looking for a change in his music. On the double album Parikrama (14202), he returned, musically at least, to the Himalayas, mixing his sitar and sampled Buddhist chant with some of the deepest, darkest music yet. The music on In Retrospect: 1980-2003 has been selected and sequenced by Parsons. It also features previously unissued material. We are pleased to add to our catalogue a recording by one who has made such an immense contribution to Celestial Harmonies, both as a recording artist and as a producer. 1 Introspect previously unissued 5'05"
3 Tibetan Plateau from Tibetan Plateau/Sounds of the Mothership (17013) 13'26"
4 Dhauladhar Dreaming from Dhauladhar Dreaming, previously unissued 7'00"
5 Whirling into the Light from Shaman (13181) 9'31"
6 Urartu to Ubud from Ngaio Gamelan (13171) 7'06"
7 Manasarovar from Yatra (18072) 28'07"
1 Maitreya from Maitreya: The Future Buddha (13214) 11'59"
2 Dorje Ling from Dorje Ling (17076) 20'28"
3 Separation from Tibetan Plateau/Sounds of the Mothership (17013) 5'38"
4 Himalaya from Himalaya (17059) 19'21"
5 Shaman from Shaman (13181) 7'01"